The rehearsal dinner is traditionally held after the bridal party ceremony rehearsal and a night or two before the actual wedding. They're the party that's held before the party and a good chance for the bridal party and the couple's families to get together for a bit of casual fun before the more formal big event. 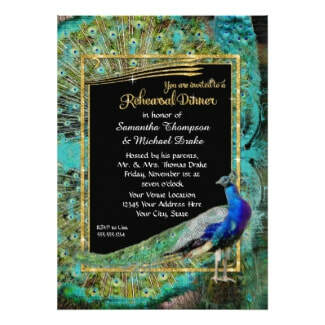 A glamorous art deco design featuring a peacock in full feather serves as the border on this modern vintage style rehearsal dinner invitation. Faux gold and diamonds glitter on this chic floral leaf swirl design done in the vintage art nouveau style add sprakle to these rehearsal dinner invites. 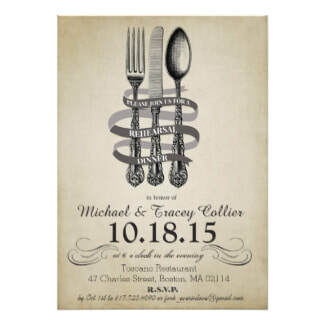 An illustration of vintage silverware, a fork, spoon and knife, invite guests to dine with you at your rehearsal dinner on these antique look invites. What is the Rehearsal Dinner All About? After practicing the ceremonial placements and movements, the rehearsal dinner is about thanking your wedding party and family for all they've done leading up to the nuptials. It's the perfect time to present any gifts you might have bought for them. It doesn't have to be a big formal dinner but can be if that's what you want. A less expensive family-style dinner or even a good old-fashioned backyard barbecue will do. The rehearsal dinner is a great time to connect with those closest to you because most-likely there will be way less time for chatting with them at the reception. A cute pink vintage style trailer with red and blue banners gives your intended guests the head-up about your fun rehearsal dinner party. 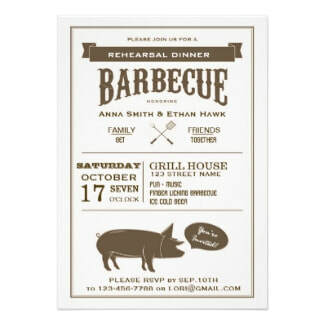 Invite your bridal party to a fun backyard barbecue with these vintage style rehearsal dinner party invites featuring an illustrated pig. 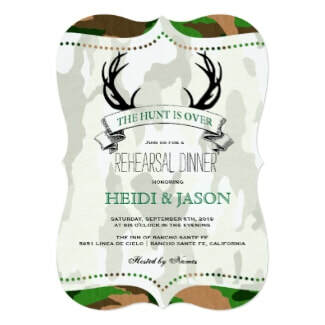 If he or she or both love hunting this rustic camo personalized rehearsal dinner party invitation will be THE perfect choice. 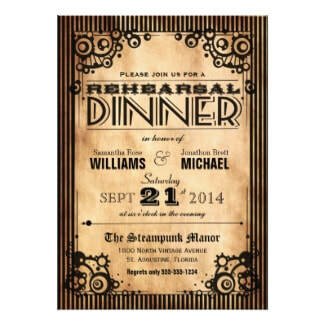 Do the Rehearsal Dinner Invitations Have To Match The Wedding Stationery? The rehearsal dinner is traditionally given by the parents of the groom but nowadays we're much less formal and it can be given by anyone, including the couple themselves. In any event, and no matter who throws it, your rehearsal dinner invitations do not have to match your wedding stationery leaving room for some fun choices. Keeping that in mind, your invites should match the formality of the dinner you are hosting. Luckily, Retro Invites has lots of choices from all decades to help you find the most chic and sophisticated, or comfortable and casual, retro style invitation that's just right for your occasion. 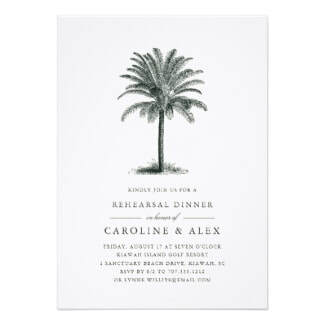 Vintage style rehearsal dinner invite features an etched palm tree illustration for a beach theme or coastal dinner party. Newly painted artwork is created to look vintage. 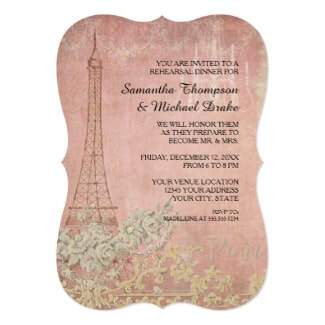 Done in pink and rose with Eiffel Tower and floral design for an elegant rehearsal dinner. Fun vintage look Steampunk design has a swirling gear flourish and a thin striped border surrounding your personalized party information. All of the invitations featured above are brought to you by our affiliate, Zazzle.com, a world leader in custom and personalized paper products, home decor, apparel, and other gift items. They are designed by the artists who keep shop there which means that each invitation is individually priced. To avoid disappointment, be sure to check prices before purchasing. 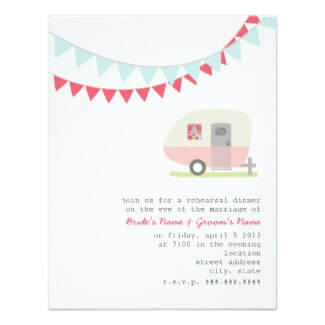 All of the invitations at Zazzle can be customized to your liking. Choose from several different card stock colors and paper types as well as border edge styles and shapes. Each invite comes complete with a white envelope and Zazzle's 100% satisfaction guarantee. ​Click on your favorites to learn more and order today!